Cabalistic writer and poet; born about 1625; died at Mantua Oct. 1, 1697. It is generally supposed that his birthplace was Amsterdam, although, like the Amsterdam rabbi Saul Levi Mortheira, he probably lived in Venice, the residence of a brother named Nehemiah. He was a pupil of Morteira, on whose death he composed a long elegy (edited by Kaufmann in "R. E. J." xxxvii. 115 et seq. ), and he was also a fellow student of Baruch Spinoza. He was inclined to mysticism from his youth, and at one time fasted forty days that he might forget the Latin which he had learned, since, in his opinion, it could not be reconciled with cabalistic truths. To continue his Talmudic studies he went from Amsterdam to Posen or Poland, as is clear from the letterof recommendation which he gave at Venice in 1672 to the delegates who had come to Italy to collect money for the oppressed Polish communities. It was his intention to make a pilgrimage to Palestine, but on the way he was persuaded to remain as rabbi in Venice, where he stayed, with the exception of a short residence in Padua, from 1645 until the summer of 1673. He was then called to Mantua at a fixed salary of 300 ducats, and remained there until his death, twenty-four years later. His epitaph is given by Wolf ("Bibl. Hebr." iv. 1200) and by Landshuth ("'Ammude ha-'Abodah," p. 215). Zacuto applied himself with great diligence to the study of the Cabala under Ḥayyim Vital's pupil Benjamin ha-Levi, who had come to Italy from Safed; and this remained the chief occupation of his life. He established a seminary for the study of the Cabala; and his favorite pupils, Benjamin ha-Kohen and Abraham Rovigo, often visited him for months at a time at Venice or Mantua, to investigate cabalistic mysteries. Zacuto was not without poetic talent, but his verses seldom rise above mediocrity. He composed forty-seven liturgical poems, chiefly cabalistic, enumerated by Landshuth (l.c. pp. 216 et seq.). Some of them have been printed in the festal hymns "Hen Ḳol Ḥadash," edited by Moses Ottolenghi (Amsterdam, 1712), and others have been incorporated in different prayer-books. He wrote also penitential poems ("Tiḳḳun Shobabim," Venice, 1712; Leghorn, 1740) for the service on the evening before the day of New Moon, as well as prayers for Hosha'na Rabbah and similar occasions, all in the spirit of the Cabala. Zacuto was, moreover, the author of a poem containing a thousand words, each beginning with the letter "alef" ("Elef Alpin"; printed with a commentary at the end of the "Iggerot ha-ReMeZ," pp. 43 et seq. 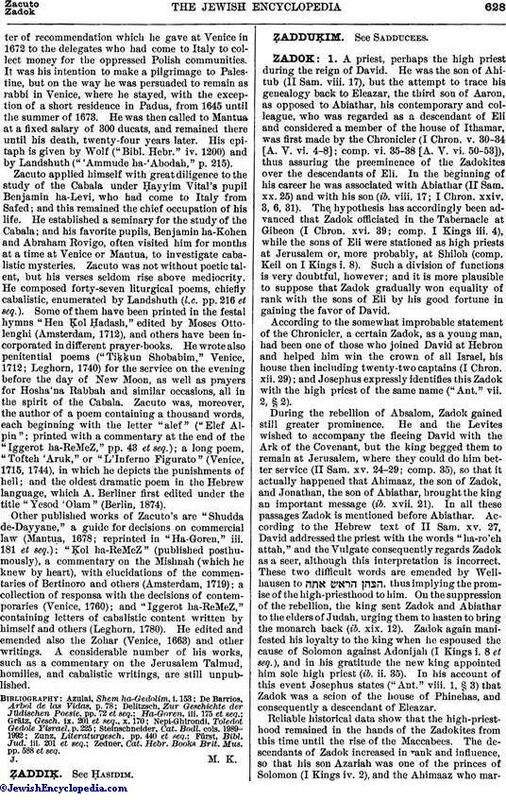 ); a long poem, "Tofteh 'Aruk," or "L'Inferno Figurato" (Venice, 1715, 1744), in which he depicts the punishments of hell; and the oldest dramatic poem in the Hebrew language, which A. Berliner first edited under the title "Yesod 'Olam" (Berlin, 1874). Other published works of Zacuto's are "Shudda de-Dayyane," a guide for decisions on commercial law (Mantua, 1678; reprinted in "Ha-Goren," iii. 181 et seq. ); "Ḳol ha-ReMeZ" (published posthumously), a commentary on the Mishnah (which he knew by heart), with elucidations of the commentaries of Bertinoro and others (Amsterdam, 1719); a collection of responsa with the decisions of contemporaries (Venice, 1760); and "Iggerot ha-ReMeZ," containing letters of cabalistic content written by himself and others (Leghorn, 1780). 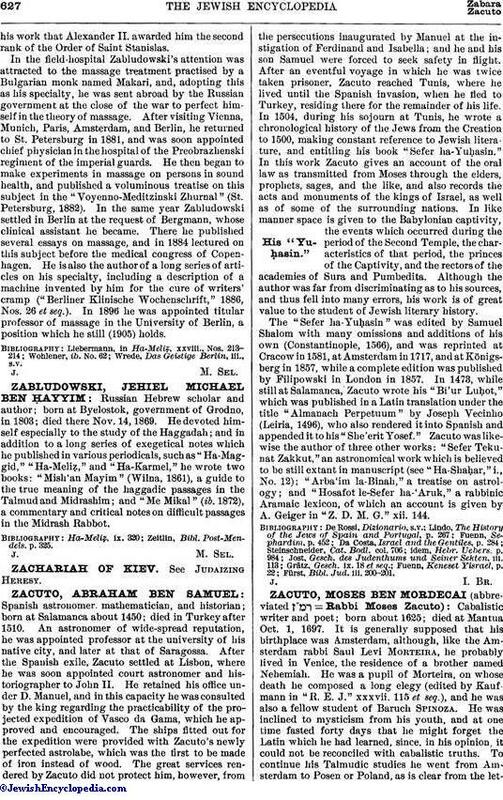 He edited and emended also the Zohar (Venice, 1663) and other writings. A considerable number of his works, such as a commentary on the Jerusalem Talmud, homilies, and cabalistic writings, are still unpublished. Zedner, Cat. Hebr. Books Brit. Mus. pp. 588 et seq.